We hit very thick ice last night. That is exactly what the scientists were waiting for. So the ship just tucked up into the ice, let down a metal ramp, and down we went. 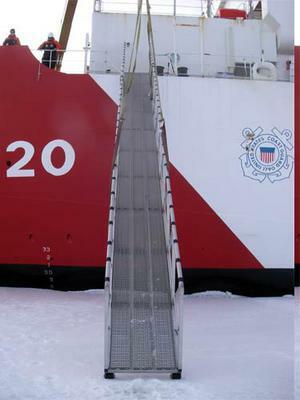 The scientists were able to walk off the boat by way of this metal ramp. They had to grasp the handrails and walk backwards down the ramp. It was like climbing down a ladder. All of the scientists were very excited to get off the boat. They have been researching in a lab since the cruise started. Most of the scientists are doing experiments associated with or needing seawater. Most of the scientists are working with sea water. The collection of sea water directly from these holes was a new protocol. 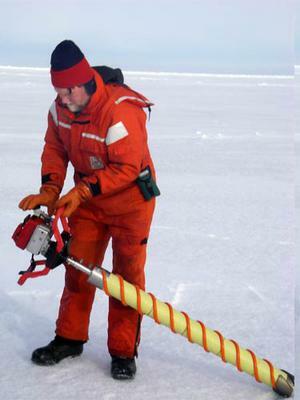 The stop on the ice was the first for all of them, to drill ice cores, to collect ice and water directly from the hole. Dr. Ned Cokelet drills an ice core using a gas powered engine. It allows the scientists to take samples quickly and efficiently. When they return to the ship, they test it to see what secrets it may tell. Remember the reason they were collecting ice samples, was because of the puzzling results they were getting. 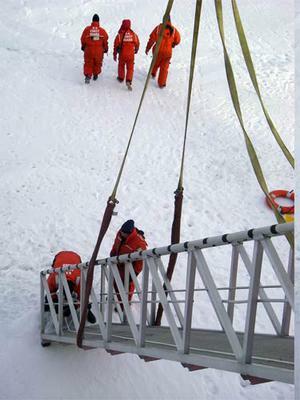 Ice samples were brought back onboard the Healy by attaching a rope and dragging them up the ramp. I believe every single scientist and assistant were on the ice except the marine mammal and bird folks, who are doing a different kind of sampling. The scientists were on the ice from 8:30 am through 11 am. That is the time when oxygen release and chlorophyll is dramatically observed and measured. They will be returning to the ice three more times to take the ice samples. Seal Tagging: Oh, but my day was not over yet. I was about to get a hands-on experience in tagging ice seals. Instead of re-explaining it all here, I thought I could ask you to go into my journals and check the entry ‘Seal Tagging Adventure.’ You can get very good details and photos of the event. We got back to the ship around four pm. My tail was dragging from leaping over snow banks and falling over ice chunks. Tagging seals is a very rigorous science occupation. 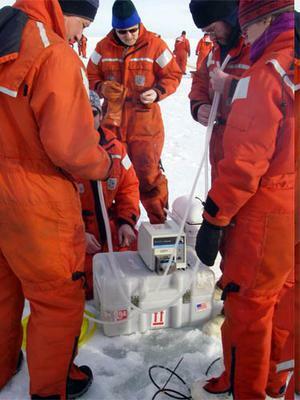 This entry was posted in 2007, Maggie Prevenas, NOAA Fisheries Service, NOAA Teacher at Sea and tagged Bering Sea, ecosystem survey, ice core, productivity, Sea Ice, seal tagging, uscg healy. Bookmark the permalink.